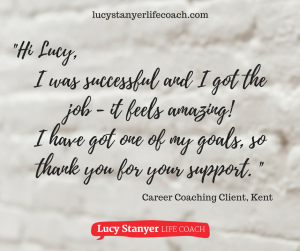 Teresa invested in Career Coaching with me to work on her confidence and communication skills because each time she was shortlisted for a promotion, she didn’t quite make it to the finish line. She was a Ward Manager in an NHS Trust and wanted to move up to a more strategic Modern Matron role – which she has now just started in! Teresa said: “Since participating in coaching sessions with Lucy my confidence has grown and also my communication skills have improved. “Lucy was very good in teasing out those areas that I had difficulty facing and she understood my concerns very well. Therefore, I was able to address my weakness and my strengths in a more productive manner, which enable me to reframe the way I was thinking and this improved my mindset – I was able to visualise my career pathway more clearly. “Lucy was very flexible in her approach and this suited me very well, I felt comfortable because it takes time for me to open-up and to build up trust. “The interview role-play helped me the most because I lacked confidence at the start of the coaching sessions, this helped me to work on my self-esteem by rehearsing the interview before I faced the real situation. “I found the exercises and the documents very useful because it helped me to stay on track. One of my goals was to look at my CV and to align my skills with the job description(s), this helped me to really explore those areas in depth. She did it! She got the job! Teresa applied everything that she has worked on through the coaching journey and got the Modern Matron job, she said: “I have achieved my ultimate goal in my career pathway, so far. I got the job! It feels amazing! If you’ve been inspired by Teresa’s career development success and would like to find out how coaching can help you make a step change in your career or help you with a business start up, then why not book one of my free discovery sessions. Coaching can help you with your return to work, career change or support to tackle job interviews, plus get a better work-life-family balance. There’s no obligation and no charge for this 45 minute discovery call. If you like my approach, then we can book your first session and start your journey to making change with confidence!